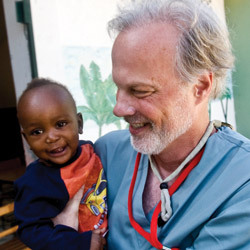 John Thoburn (below) and Kira Mauseth (above) in July 2010, returned to Haiti this October to train volunteers to teach the Health Support Team curriculum Mauseth developed. On her first trip to Port-au-Prince, Haiti, in March 2010, Kira Mauseth did a lot of listening. Against the backdrop of broken buildings scattered like Lego pieces, she spent 12-hour days offering psychological first aid to kids and adults. "It was the same stuff over and over," says Mauseth, who earned a doctorate in clinical psychology from Seattle Pacific University in 2008. "Deep breathing exer­cises. Teaching people how the body and brain react to trauma, that what they were feeling was normal." Psychological first aid helps survivors of disaster — such as the earthquake that devastated Haiti on January 12, 2010 — deal with anxiety and other mental issues that arise from the trauma, once their basic needs for food, clothing, shelter, and medical attention are met. But in Haiti, Mauseth says, this work "felt like bailing out the ocean. There'd be no long-term impact after we left." Back home, Mauseth considered how the benefits of psychological first aid could be extended. With some training, she realized, Haitian volunteers could provide psychological first aid — and train others to do so. Mauseth, an adjunct professor of psychology at Seattle University, worked with a colleague to pull together a training curriculum in three weeks. Based on active listening techniques, the curriculum covered self-soothing exercises, ways to live in the present, and how to identify serious issues, such as post-traumatic stress disorder, that require additional care. Then a contact in Haiti translated the material into French and Creole. In May 2010, Mauseth returned to Haiti with Michael Tandy Ph.D. '07 to begin training with the new curriculum. More than 20 volunteers came to the first session. "The Haitians took the relaxation skills seriously," says Tandy. But Mauseth was left with a question: Would the trained volunteers be able to help? In July 2010 she returned to Haiti to train a second group of 53 volunteers with John Thoburn, associate professor of clinical psychology at Seattle Pacific and a recognized expert in international and disaster psychology. Thoburn, who has counseled disaster survivors in Uganda, Bosnia, and Sri Lanka, first introduced Mauseth to psychological first aid. He believes training locals is vital. "There are so many cultural nuances to learn in providing aid in other countries," he says. "It's important to be community-oriented and train indigenous volunteers." Mauseth and Thoburn also checked in with eight volunteers trained in May and learned they had been using the curriculum. And one volunteer's experience offered some hope. "A neighbor came to the volunteer and said she couldn't get past the death of her husband," recounts Mauseth. "The trainee said normally he would have known what to say. But after the training, he knew to listen to her and hear her pain. It had a calming effect. He said it allowed her to process it and start to move on."